Every NFL season at least one sleeper team appears to emerge out of nowhere to make a run at the playoffs, laying waste to Vegas betting lines and power rankings alike. Last season, the not-so-lowly-as-it-turns-out Arizona Cardinals rattled off six straight wins, en route to racing out to a 9-1 record, heading into Week 12. From there, the Cards went on to close out the regular season at 11-5, before losing a wild card game on the road at Carolina, with third-string quarterback, Ryan Lindley, at the controls. While the Cardinals were the ultimate sleeper out of the NFC West last season, these three teams will look to turn the upcoming NFL season into the perfect storm of wily veterans, hot shot rookies, favorable scheduling, and, of course, a few lucky bounces in this ultimate game of inches. 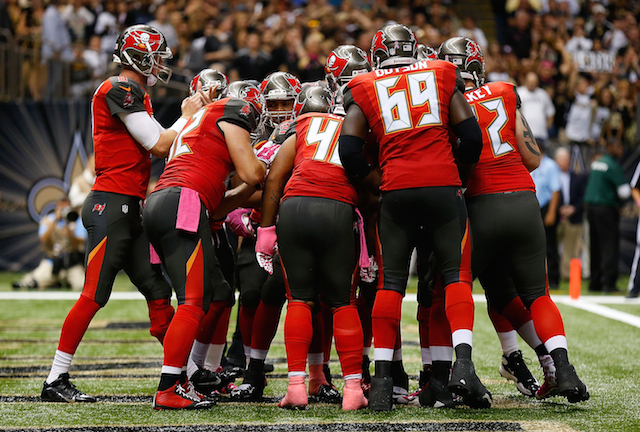 The Tampa Bay Buccaneers are coming off a 2014-2015 campaign when they went 2-14, not a record to be proud of, but it’s worth noting that five of those losses were by three points, or less. The Bucs, of course, went on to parlay their number one overall 2015 draft pick into Jameis Winston. As a winner, Winston went 26-1, won one National Championship, and claimed the Heisman Trophy for his FSU mantle piece. Winston, at 6-foot-4 230 pounds, has echoes of Ben Roethlisberger, particularly in his ability to stand tall in the pocket, convert broken plays, and still make all of the NFL throws. In 2004, Ben Roethlisberger went 13-0 as a rookie starter, as part of a 15-1 season for the Steelers. We’re not expecting a single-loss season for the Bucs, but something like 9-7 may not be out of reach, especially if Winston were to simply manage the game and limit turnovers. The Miami Dolphins may be enjoying some newfound renown as darlings of the Ivy League, but the team is never the less lost in the AFC East Shuffle, victims to the New England Patriots, Rex Ryan, and the massive New York City media. The Patriots, of course, will be coming off their fourth Super Bowl win in fifteen years, and have claimed 12 out of the past 14 AFC East division titles. Still, Ryan Tannehill has quietly emerged as the second best quarterback in the division after Tom Brady, and. last season, he completed 66% of his passes for 4,045 yards and 29 touchdowns against only 12 interceptions. The Dolphins signed marquee free agent Ndamukong Suh to a six-year $114 million contract this offseason. Suh will shore up the team’s defense and be out to wreak havoc in the trenches, mixing things up on the opposing sidelines, and undoubtedly ratcheting up the intensity and toughness in South Florida. Perhaps most importantly for Miami — the possibility that the NFL will uphold Tom Brady’s four-game suspension. If, an untested Jimmy Garoppolo may be called upon to start and open the season against Pittsburgh, Buffalo, Jacksonville, and Dallas, the Patriots may be sitting at 1-3 before a rusty Tom Brady makes his return. 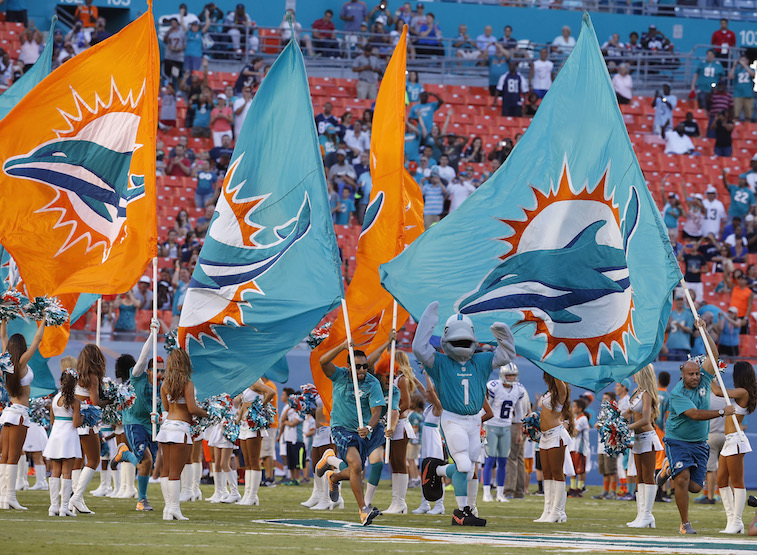 In Week 17, the Dolphins will play host to the Patriots in Miami for the last game of the season. This showdown will likely put the AFC East crown, playoff seeding, and even home-field advantage on the line. Let’s be clear, this all depends on a return of vintage Adrian Peterson — the guy who would take the inside hand-off before powering through arm tackles at the line of scrimmage for six. In 2012, AP racked up 2097 rushing yards and carried the Vikings into the playoffs. Peterson, at his best, has been compared to the great Jim Brown, as the ultimate combination of size and speed. AP sat out the majority of last season. 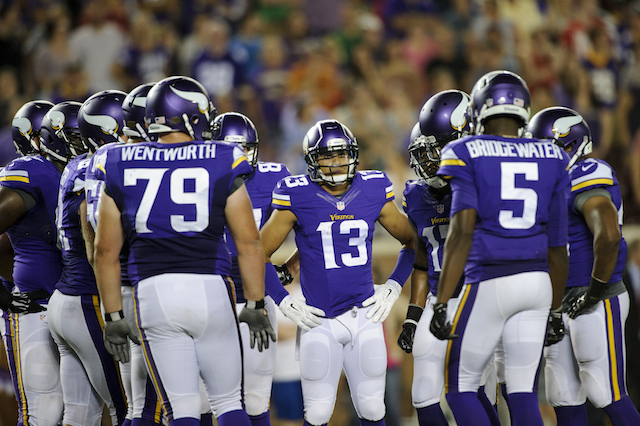 Without Peterson, the 2014 Vikings still managed a 7-9 record, behind rookie quarterback Teddy Bridgewater. For his part, Bridgewater showed encouraging flashes as a dual-threat quarterback accounting for 3,128 yards and 15 touchdowns total, through the air and ground. This season, Adrian Peterson will be back, and out for revenge after feeling put out to pasture amid his legal troubles. The Vikings also traded for Mike Wallace this offseason, who once burnt opposing corners for 21 yards per catch, as a young receiver in Pittsburgh. The Vikings’ rebuilding plan appears to be turning the corner, just as the finishing touches are being put upon their new 2016 home, the U.S. Bank Stadium, in downtown Minneapolis.